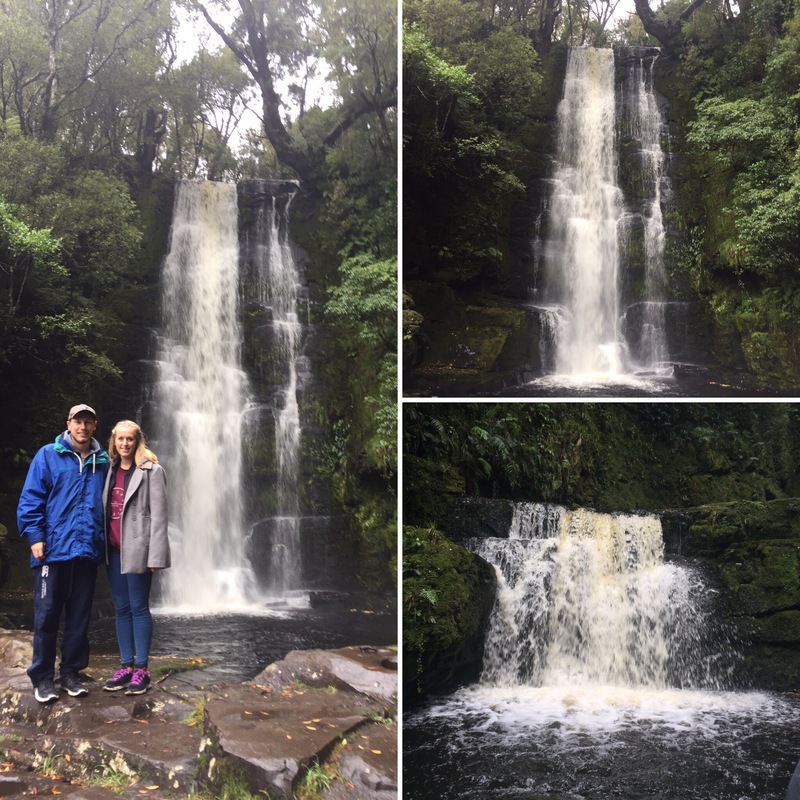 On the 23rd April 2017, we were picked up at around 5pm in Te Anua and had to sit on a very crowded bus that was coming back from Milford Sound for about 40 minutes before we were dropped off in Mossburn to get our smaller ‘Deep South‘ tour bus that we would be on for the next few days. There turned out only to be 4 of us on the bus which we didn’t mind seeing as it meant more leg room and, as we are travelling together, it’s not like we needed to worry about meeting loads of people. 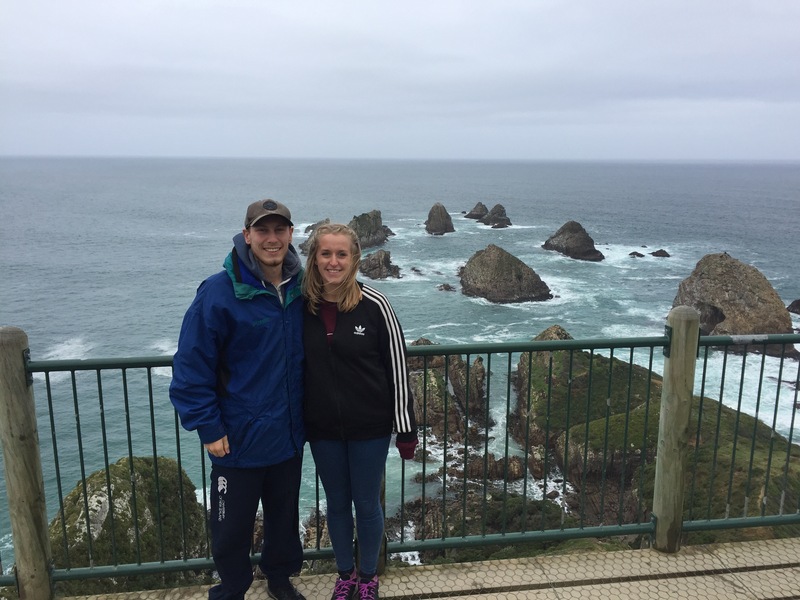 It was around an hour and a half to our first stop, Invercargill, where we would be spending the night before continuing down the coast in the morning. 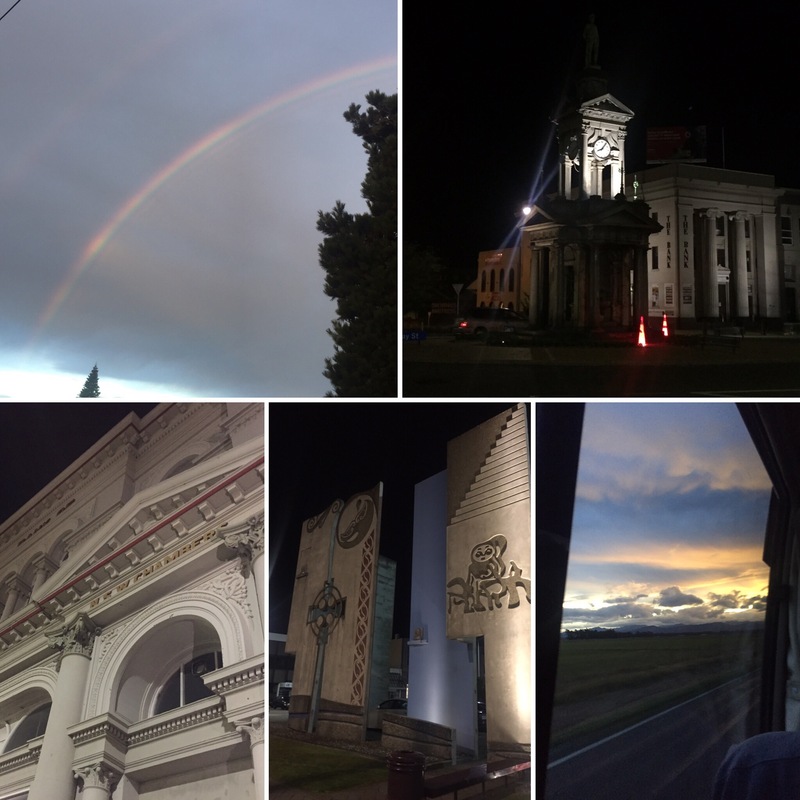 By the time we got to Invercargill it was dark but we still went for a walk to have a look at what we could. It’s a small place but it has some pretty buildings which probably look nicer in daylight. 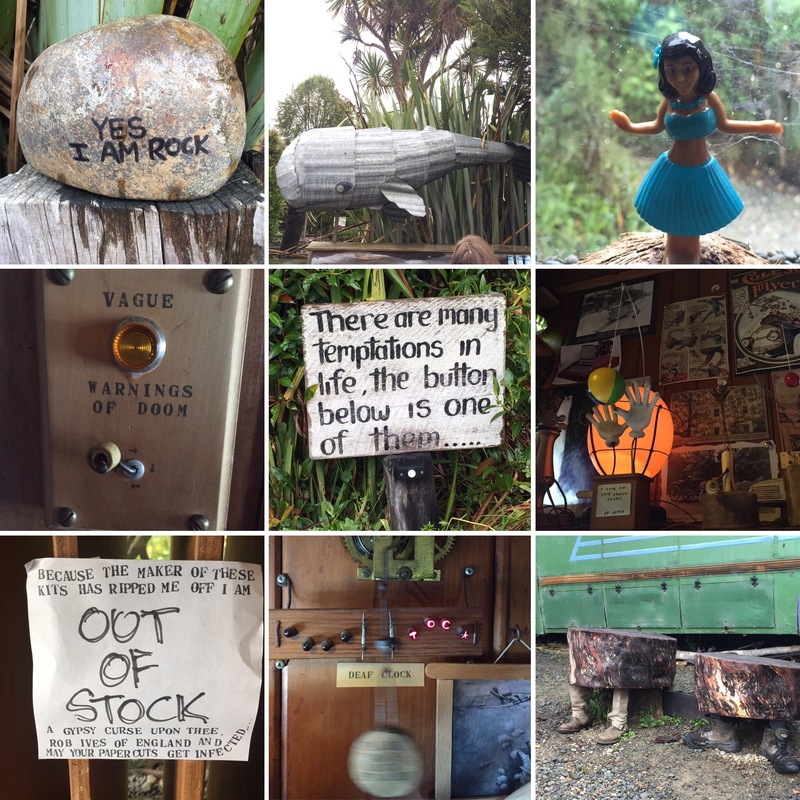 We were staying at the Tuatara Lodge which was just a standard hostel really but did have good wifi (always a bonus). We had to be back on the bus at 8:30am the next day to get down to Bluff to pick someone up at 9. As what seems to always be the case with our luck on this trip to New Zealand, it was very overcast when we left Invercargill instead of the beautiful blue skies we were hoping for. We arrived on time to the sleepy port town of Bluff which is the oldest settlement in New Zealand. 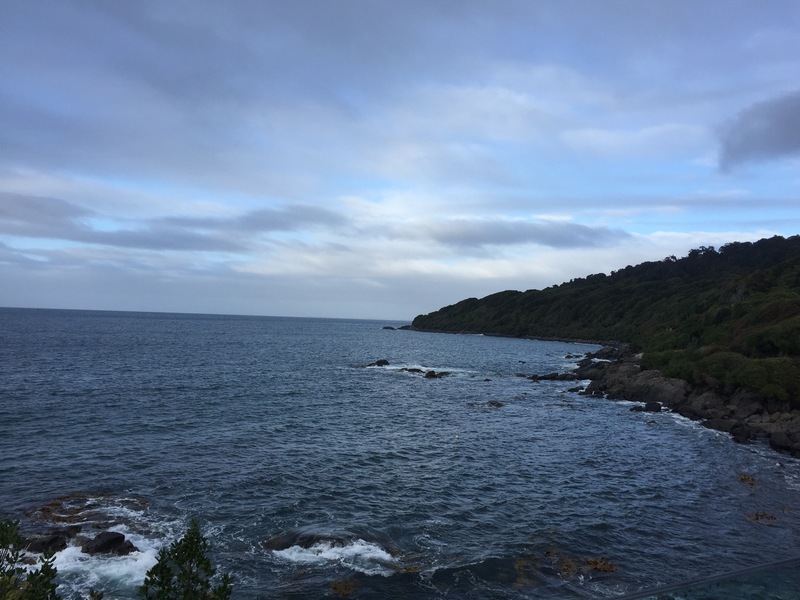 I think the main reason people now come to Bluff is to get the ferry over to Stewart Island but we didn’t have the money for this (which is a shame as it was recommended to us when we first arrived in Australia). After picking up our last passenger, we stopped off at Stirling Point which is the most southerly point of the two mainland islands. 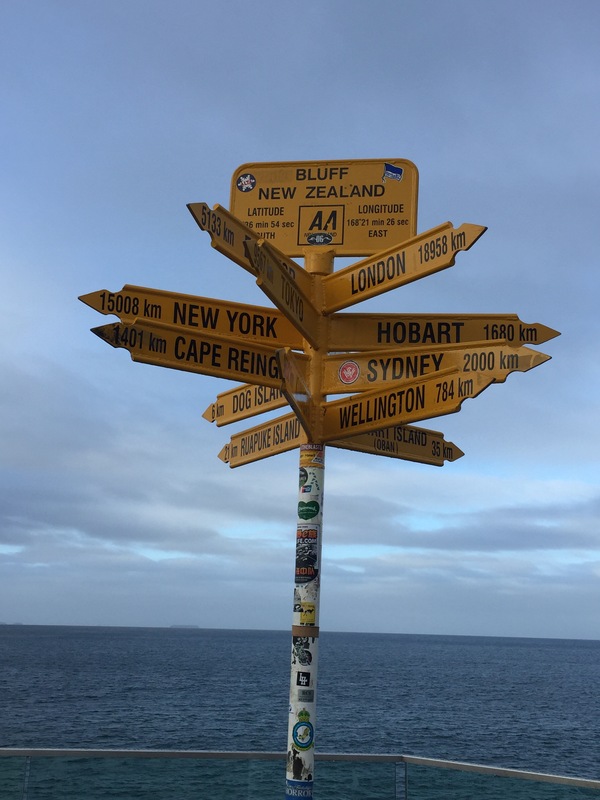 This means we have now been to the most northerly (Cape Reinga) and the most southerly point (Bluff) of New Zealand which is pretty cool. There is a sign there, like in the north, of the distances to various places and apparently it is a famous sign – not sure the exact reason why though. 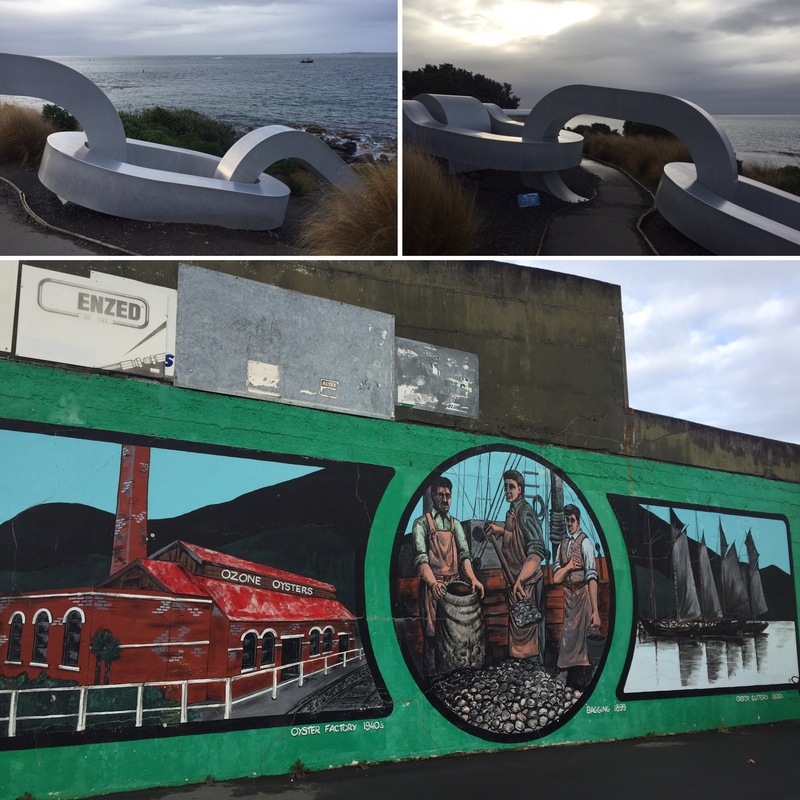 At Stirling Point there was also a chain link statue that you could walk through which was built to signify the signing of the treaty between the Maori and the British Empire. Bluff is also famous for its oysters but apparently they had run out of them when we were there so we didn’t get to try any. They even had some murals on the walls of their buildings documenting the oyster history in the area. 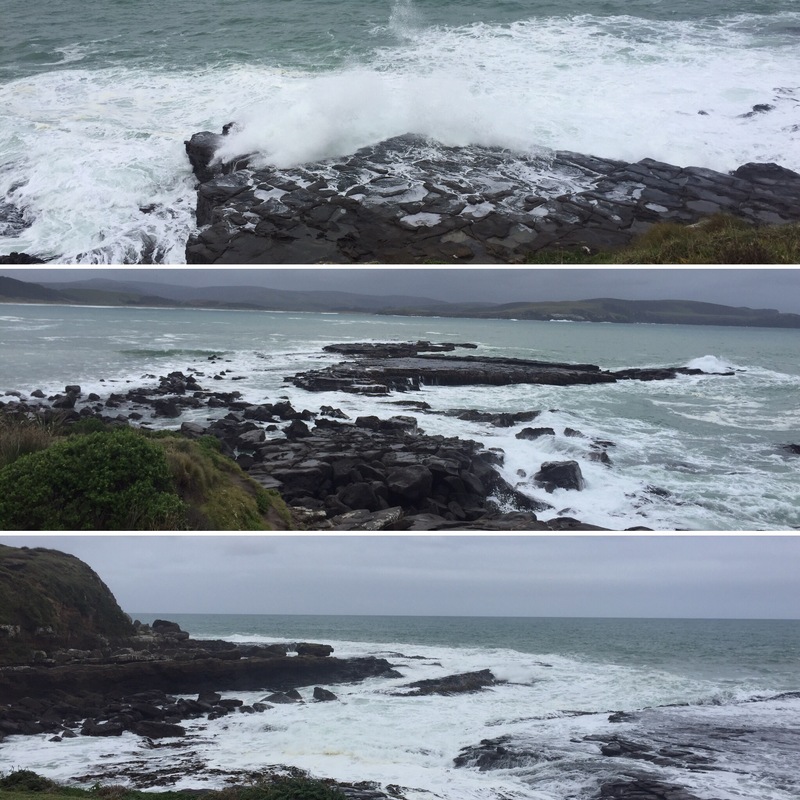 Our next stop through the Catlins was to Porpoise Bay. The sky hadn’t cleared up like we had hoped it would but it was still relatively clear out to sea and wasn’t raining so we were happy about that. There were enormous waves crashing over rocks making it look like they had a layer of frothy milk on them. It was probably cooler seeing the rocks when the sea was a bit rougher for this reason. 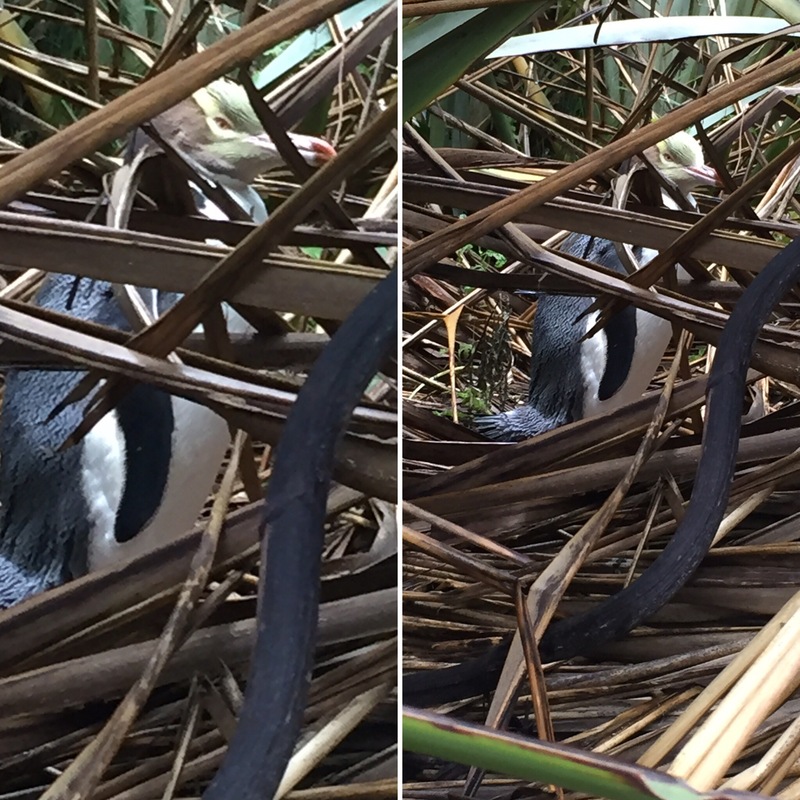 We passed our guide, James, who had just spotted a penguin so he took us into the bush to show us. An American girl from our group was also there and nearly scared it away because she was so loud but once she got her picture she left and then me and Niall were able to get a lot closer to it in the bush to get a better look at it. The penguin was a yellow eyed penguin and had yellow feathers on its head around its eyes which were really bright. Apparently they’re rare to see this time of year because they’re malting so they like to stay well hidden – we’re so pleased we got to see one. 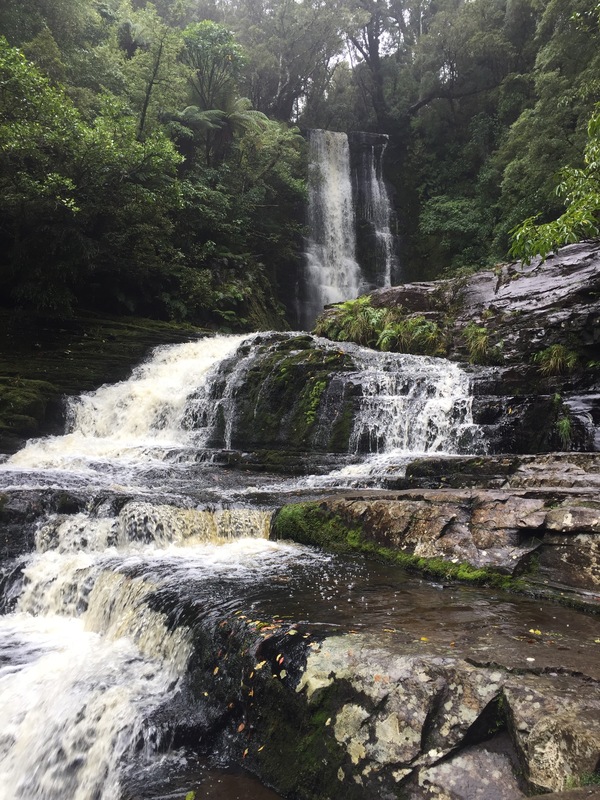 After more driving we arrived at a dense part of the rainforest that lead us to McLean falls, the Catlins’ tallest waterfall at 22m. It was a really nice waterfall that had some smaller falls carrying on from it down the river. 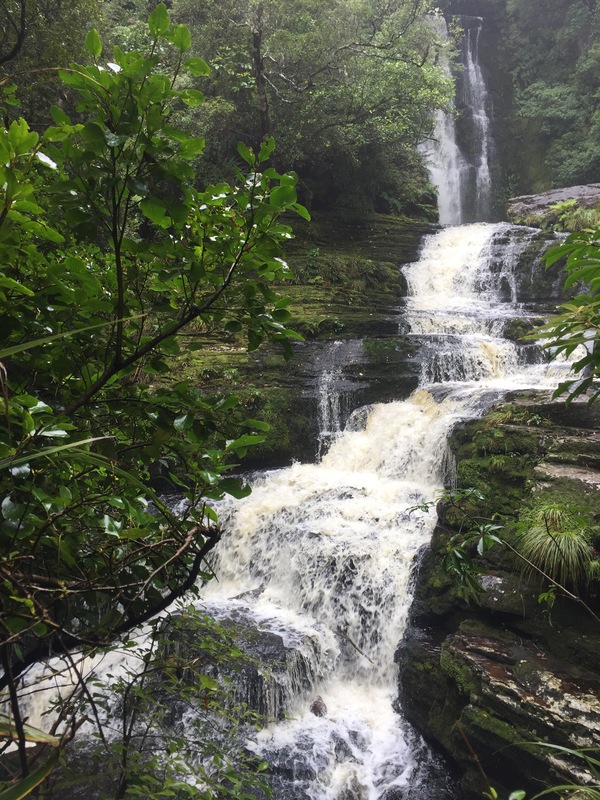 Our guide showed us where to climb up the rocks to get up by the largest bit of the waterfall so that we could see it much better even though it did get us a bit muddy! 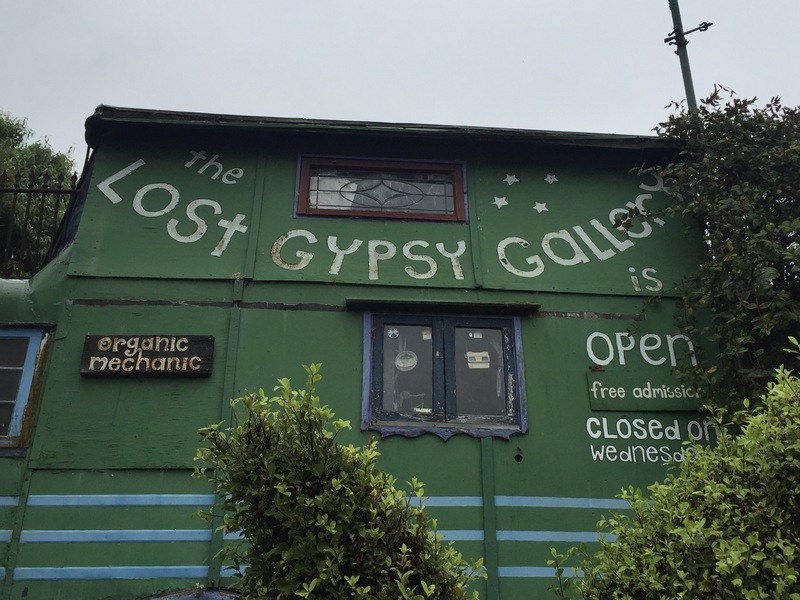 We then stopped off in Papatowai for the driver to get some lunch and for us to go to the Lost Gypsy Gallery which is a bus full of little inventions and art installations all set up by an artist who lives in the house next door. The whole place is very interactive and quirky and it was cool to look around and play with all the little machines, albeit very random! One of my favourites was a giant whale that moved when you wound the handle. 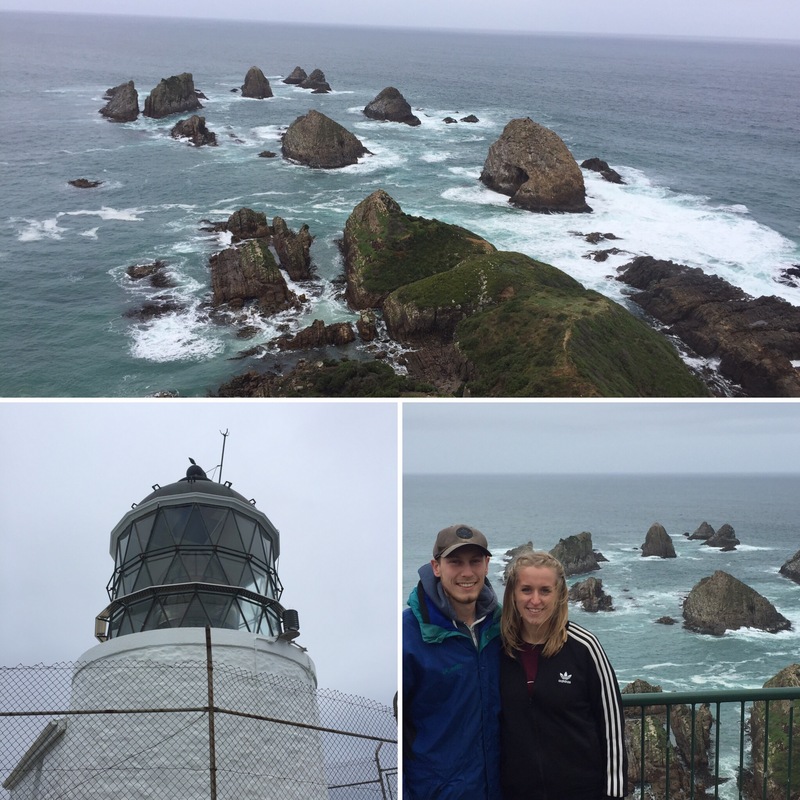 Our final stop before we headed for Dunedin was to Nugget Point. This was a nice walk along a coastal path that led to a lighthouse and the ‘nuggets’ which were a series of rock formations out to sea. The highlight of this segment of the trip was all the seals! Our guide had brought a pair of binoculars so that we could all see the seals better as the rocks were very far away. There were even some seals climbing to the top of some of the ‘nuggets’ for some unknown, very dangerous reason! On the way out of Nugget Point we stopped at a place good for penguin spotting but we didn’t see any. I think it was a little early for them to be coming in from their feeding but it wasn’t the end of the world seeing as we saw one earlier on so close up. 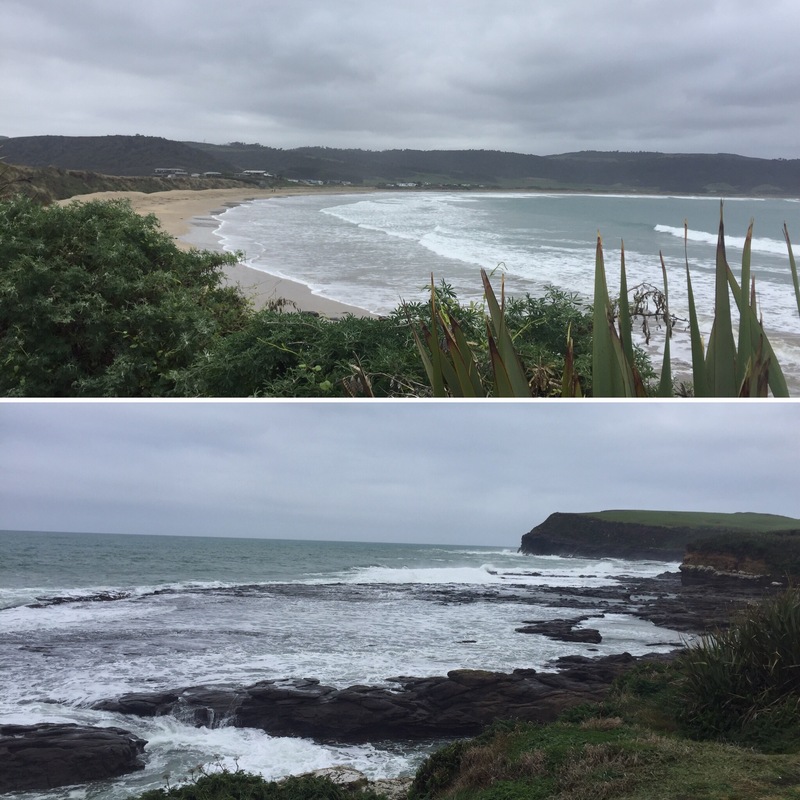 It was a good day and we got to see a lot of the southern coastline of New Zealand. It was also nice there only being a few of us as it meant we could stay places longer or leave earlier if we fancied which made the trip more enjoyable as well. 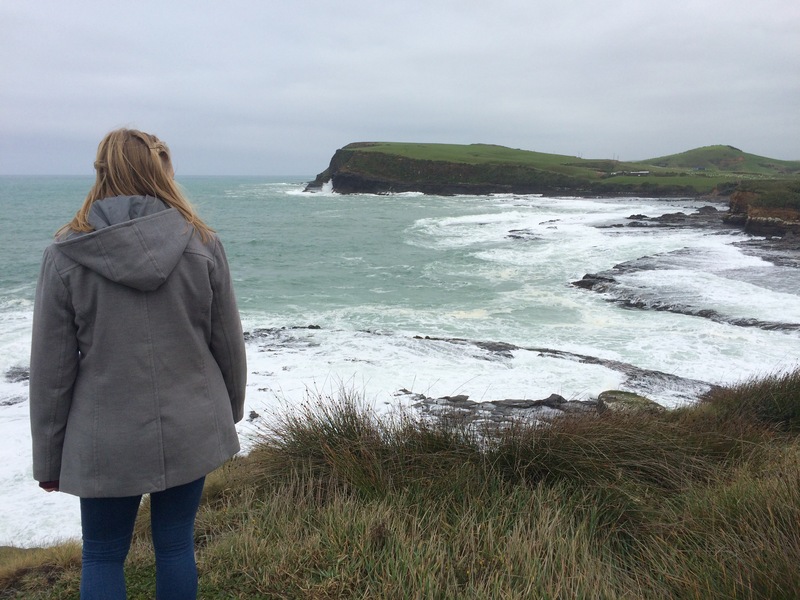 The coastline is very pretty too – even more so I imagine in blue skies and sunshine – and so it was nice to get to see it when a lot of people end up missing it out as it’s quite remote.